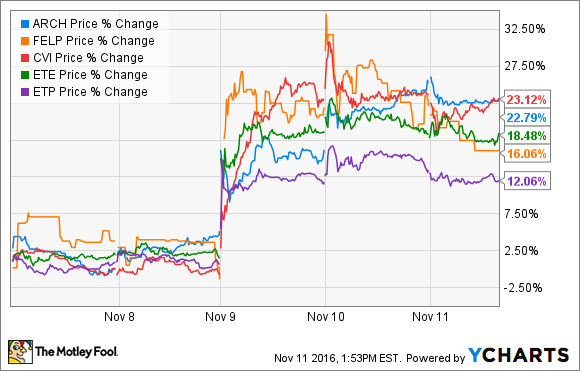 Trump’s unexpected win drove Energy Transfer Partners, Arch Coal, Foresight Energy, CVR Energy, and Energy Transfer Equity up by double digits this week. The Trump victory is good news for coal stocks Arch Coal and Foresight Energy, because he said he would end the "war on coal." He plans to do so by enacting several pro-coal policies, including lifting the moratorium on coal leasing on federal lands, rescinding several regulations that have negatively affected the coal industry, and promoting clean coal power generation. These policy initiatives could fuel more demand for coal and improve producer profitability. Independent refining companies, including CRV Energy, also spiked this week in the wake of the Trump win. That's because Trump promised to lift many of the regulatory burdens that have plagued American energy companies in recent years, including the problematic renewable fuel standard program. CRV Energy's refining arm is one of several to complain about that program. Last quarter, its CEO said the "exorbitant costs of renewable identification numbers under the broken renewable fuel standard program" hurt its results and is punishing the company even though it has done nothing wrong. Given Trump's pledge to ease these regulations, it should remove the impact of this massive headwind on CVR Energy's refining arm. Trump's America-first energy plan would put the country on the path toward energy independence. That means we would need more pipelines to bring oil and gas from production basins to market centers, including Energy Transfer Partners' contested Bakken Pipeline. As such, Trump's win means its oil pipeline will probably move forward. Meanwhile, Trump's plan will likely drive demand for additional pipeline projects, which opens the door for Energy Transfer Equity's pipeline subsidiaries to capture some of these opportunities in the future. Trump's win could reinvigorate America's coal industry, ease burdens on independent refiners, and make it easier for pipeline companies to construct projects. That has the potential to fuel more profits to the companies operating in each of those sectors, which is why their stock prices surged this week. But investors need to be careful before jumping into these stocks just because of the election outcome, as Trump might not be able to do everything he would like. And even if he does, not everything will work out as hoped for with these companies. Instead, investors need to continue to take a measured approach and focus on the long-term outlook until it's evident what impact the new president can have on the energy industry.